Hello everyone! Today I have two fun rainbow ombre background birthday cards using the new Quilted Hexagon Stamps and the coordinating dies from Sunny Studio Stamps. I started both cards by stamping the sentiments from Quilted Hexagon Stamps with black ink on an A2 size white panel. Then, I used a hexagon shaped die from Quilted Hexagon dies and made a different pattern for each card. It was really easy and fun to do, hence, the reason for making two similar cards. Then, I inked two A2 size smooth Bristol cardstocks with Distress Oxides using a finger dauber, creating an ombre rainbow background. Rainbow anything just makes me so happy! For the second card, I trimmed the front panel a little smaller than an A2 so that the inked background shows on the sides. I added foam adhesives to both front panels, and adhered them to the background panels. Lastly, using the Distress Oxide inks, I stamped some hearts from the Color Me Happy set around the sentiment to add more interest. Hello crafty friends! I hope you're having a wonderful week so far. 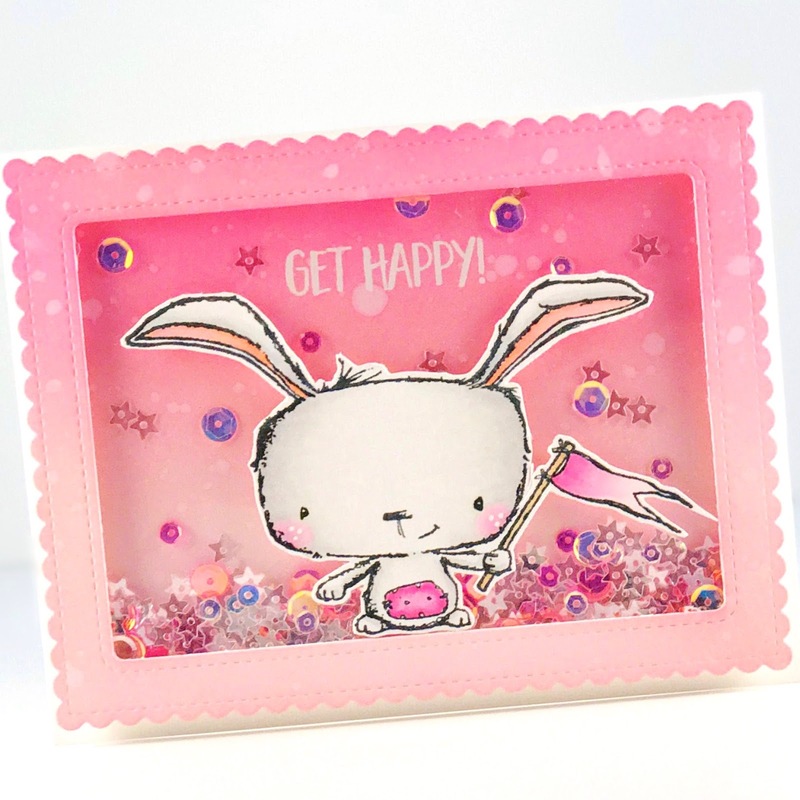 Today, I'm sharing a shaker card I made using many wonderful products from Pretty Pink Posh featuring the Fly Away Friends set. I inked an A2 size panel with different shades of blue Distress Oxides and Inks and Black Soot Distress Oxide. I used the powder tool and stamped the stars with versamark ink and added white embossing powder. I heat set the powder and added splatters of white acrylic paint. I die-cut the panel with Stitched Notes die. I adhered the trimmed heat resistent acetate with the stamped sentiment (I used the powder tool and stamped with versamark ink and heat set white embossing powder) behind the frame to create the shaker window. I adhered the negative cut to the card base to use as the background. I added star sequins and mounted the frame with 2 layers of foam tape. For the card front, I stamped the images and colored it with Copic markers and cut them out with coordinating dies. To finish, I adhered the images and the die-cut clouds to the shaker window ( I lightly applied Tumbled Glass Distress Ink to the outer edges of the clouds). Hello there! 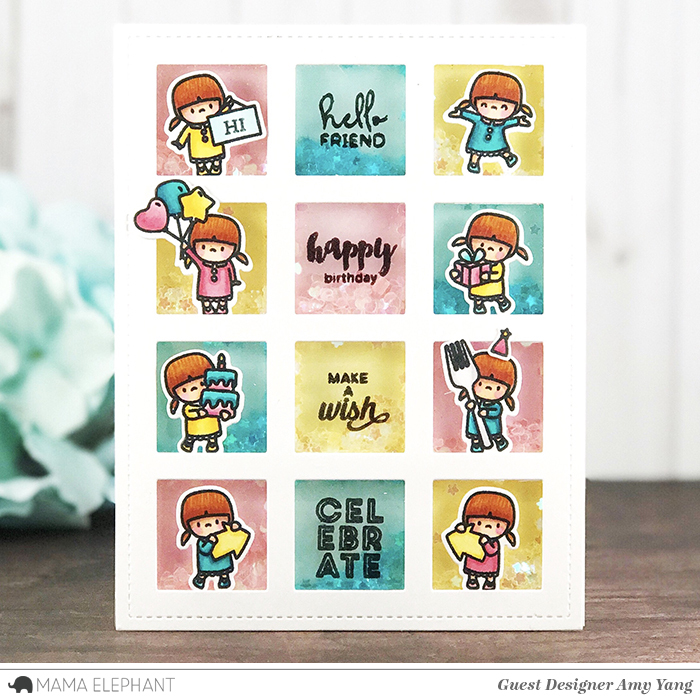 I'm here today with a card that features the new and adorable Missing Ewe set from Sunny Studio Stamps. To begin, I stamped the images and colored them with Copic markers. Next, I cut them out with their coordinating dies. I added accents with a Gelly Roll pen. I used a window frame to die-cut an opening in my front panel. Then, I used the "Miss" and "Ewe" word dies that are included in the Missing Ewe die set in order to cut out the front panel and remove the negative cuts. I used the word dies again to die-cut black cardstock. After adhering the front panel to a folded card base, I glued in the die-cut black sentiment as shown. Next, I used the negative die-cut window and inked the background with Distress Inks in Black Soot, Chipped Sapphire and Salty Ocean. I also splattered some water, added white dots with a Gelly Roll pen, and glued on die-cut stars that I made using the star dies from Happy Owl-O-Ween dies. I added Wink Of Stella to the stars for shine. After, I adhered the negative window back into the open area in the card front. For the scalloped ground, I cut another negative window with Stitched Scallop dies, and inked it with Lucky Clover and Twisted Citron Distress Inks. I also added texture to it by splattering it with water. Lastly, I adhered the scallop ground to the card front and mounted the sheep with foam tape. Win a 10$ gift certificate to www.krumspringshop.com ! Leave a comment on each step on the way of the hop for 16 chances to win a 10 $ gift certificate OR the grand prize - which is a Prize Packet containing lots of Krumspring Stamps! Giveaway ends August 23 at 12 pm Central European Time. Winners will be announced on Krumspring Blog on August 23"
Welcome everyone! 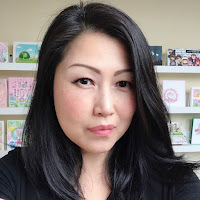 I'm so excited to be participating in the Krum Spring Stamps One Year Anniversary blog hop. If you've arrived here from Michelle Short , you are in the right place. If you're lost or starting the hop from here, I have a full list of the amazing designers on the bottom of this post. I have three cards to share with you. 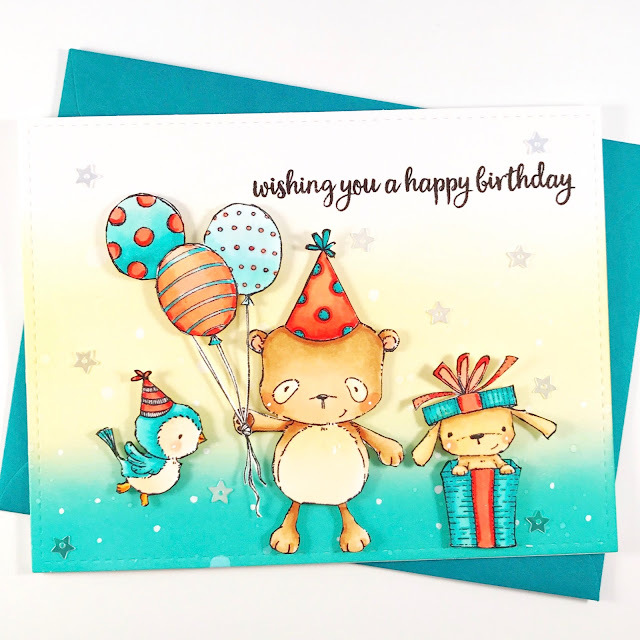 The first two cards feature the new and adorable For My Koala Bear stamp set. I stamped the koala bears and the leaves, colored them with Copic markers, and cut them out. I added Glossy accents to the noses. I used a wood grain embossing folder to add texture and interest to the front panel. I used the word die "HUGS" and die cut the panel, and adhered it to kraft base. I removed the negative, and replaced it with the die-cut rose gold cardstock. Afterwards, I mounted the images and heat embossed sentiment to the front panel. For the second card, I used another koala bear from the For My Koala Bear stamp set, as well as the heart from You Rock. I colored the bear with Copic markers. I heated embossed the heart with gold embossing powder, and colored it with Zig Real Color Brush Markers. I added splatters of gold paint to the background and mounted the frame, heat embossed sentiment, and the images with foam tape. For the last card, I used the new Bloom and Diagonal Stripes stamp sets. I stamped the front panel using the Diagonal Stripe stamp with Fossilized Amber Distress Oxide Inks. I stamped and heat embossed the flower using gold embossing powder. I colored it with Zig Real Color Brush Markers. I mounted the frame, heat embossed sentiment, the flower, and added gold sequins to finish. Thanks for stopping by! Don't forget to leave a comment for your chance to win prizes. You can check out all 8 new stamp sets at www.krumspringshop.com. Enjoy the hop! Happy Friday! Today, I'm sharing duo of cards I made using Pretty Pink Posh products featuring the adorable Halloween Friends set. It's a non-spooky (cute) halloween card, easy for mass producing. I stamped the images on smooth white cardstock, colored them with Copic markers and cut them out with coordinating dies. I also cut around the bear's arms so he can hold the candy basket and I added Star Dust Stickles to his wings. For my front panel, I die-cut two white cardstock with the Stitched Notes dies. Then, I used a Misti Stamping Tool to create a sentiment backdrop, an idea that was inspired by Jennifer Mcguire. The "Happy Halloween" sentiment included in the stamp set is a perfect size for creating this look. I used dye inks to stamp the sentiments. After, I adhered the front panel to a slightly larger patterned paper that matched the color scheme of the sentiments and then adhered that to a A2 size top folding card base. Lastly, I mounted the images with foam tape. Thanks for stopping by the blog! I wish you a wonderful and crafty weekend! Hello friends! 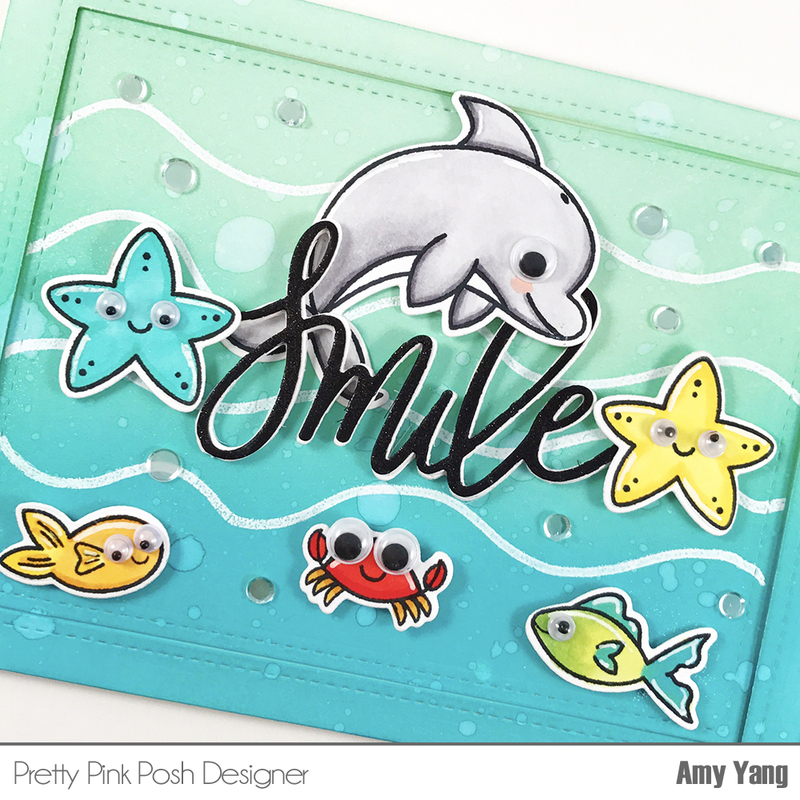 Today, I made a card using Pretty pink posh products featuring Sea Friends set. This has to be one of my favorite stamp set of underwater sea animals. The illustrations are just so adorable! For this card, I decided to elevate their cuteness and fun by adding google eyes hoping to make the recipient smile. To begin, I stamped the images and colored them with Copic Markers and cut them out with coordinating dies. I also added white lines with Gelly Roll pen. Size of these fish are perfect for googly eyes so I adhered them with glue. To create the front panel and the frame, I trimmed Bristol cardstock little bigger than A2 size and inked it with Distress Oxide Inks in Cracked Pistachios and Peacock Feathers. I added splatters of water for texture. Once dried, I used an embossing pen and drew wavy lines and heat set white embossing powder and die-cut it with Stitched notes die. For the sentiment, I die-cut Smile Shaker die three times with white cardstock and one time with black cardstock. I trimmed off just the word "Smile" and adhered all of them together with the black cardstock being one top and slightly to the left so that you can see the white outline. I went over the the word with Wink of Stella for some added shine. To assemble the card together, I adhered the front panel to an A2 size base. I mounted the frame with dimensional tape. Then, I arranged and adhered the fish and the sentiment, finishing off by adding some sequins. Thanks for stopping by and don't forget to smile (it's so good for you)! Purple Onion Designs: Sending Sun-Filled Wishes! Hi there! I hope you've had the chance to visit Purple Onion Designs to take advantage of their 25% off everything Anniversary Sale. You really don't want to miss out on this great deal that will end August 16th. I have two cards to share with you today using Purple Onion Designs rubber stamps, illustrated by Stacey Yacula. Stacey's images are always so sweet and lovable. I have the best times coloring and making cards with them. I stamped the Birch Tree background and Free Spirit Fox and Frog on trimmed A2 size white smooth cardstock and colored them with Copic Markers. I used an acetate cloud stencil to add the clouds using the blending tool and Peacock Feathers Distress Ink. I then stamped the cat and dog on a separate card stock and colored them with Copic markers as well. I stamped the sentiment on a die-cut strip paper. I mounted sentiment along with the fussy cut cat and dog to the front panel with foam adhesive. For the second card, I trimmed two 4" square white cardstock. With the first one, I stamped the Veggie Garden and colored it with Copic Markers. On the second one I used the Radiating Rays stencil from MFT stamps and inked it with shades of yellow Distress Inks. After, I die-cut an opening with Window Frames from Pretty Pink Posh and adhered the Veggie Garden behind it. Then I adhered that to a slightly larger card base. To finish, I mounted Elliot, the watering can and the sentiment to the card front. I hope you enjoyed both cards. Visit Purple Onion Designs blog for lots of great inspirations. Hello everyone! Amy here, and today I'm sharing a fun birthday shaker card featuring the super cute Little Girl Agenda set from Mama Elephant. I stamped the images, colored them with Copic markers, and used the coordinating dies to cut them out. I trimmed heat resistant acetate and smooth Bristol paper to 4-1/4" x 5-1/2". Then, using the Grid Window Creative Cuts, I die-cut white cardstock. In preparation for stamping the sentiments from Mini Messages, I laid the acetate inside the Misti and applied some powder using the EK Powder Tool. Next, I put the die-cut grid window frame on top, stamped the sentiments as shown with Versmark ink and heat embossed it with black embossing powder. To add different colors to the background panel, I laid the die-cut grid window frame again, this time on top of the trimmed Bristol paper. I lightly traced each square with a pencil. Using the outlines as a guide, I inked it with Peacock Feathers, Picked Raspberry, and Squeezed Lemonade Distress Inks as shown. I adhered the prepared acetate behind the Grid Window frame, and also added a layer of foam adhesive around each square in order to separate the sequin colors. I added sequins in each square, and mounted the background panel on top. Lastly, I adhered all the images to the top of the card. Purple Onions Design: Get Happy! 3 3/4" x 2 1/2" so she's perfect for taking center stage on cards for lots of different occasions. I stamped and colored the image using Copic markers. I distressed the trimmed background panel and the die-cut frame with Picked Raspberry and Tattered Rose Distress Inks. I splattered water and blotted dry with paper towel. I heat embossed the sentiment using white embossing powder on the background panel. After adding the sequins to the background, I mounted the framed acetate window with two layers of foam adhesive. To finish, I adhered Poppy to the front of the window. 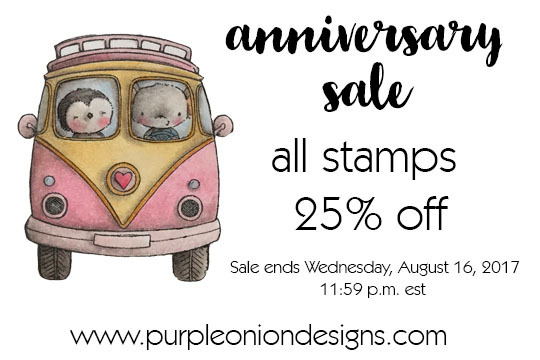 You can pick up Poppy and lots of other great Purple Onion Designs rubber stamps at 25% off from now to August 16th. Don't miss out on this great sale! Happy shopping! Hello everyone! 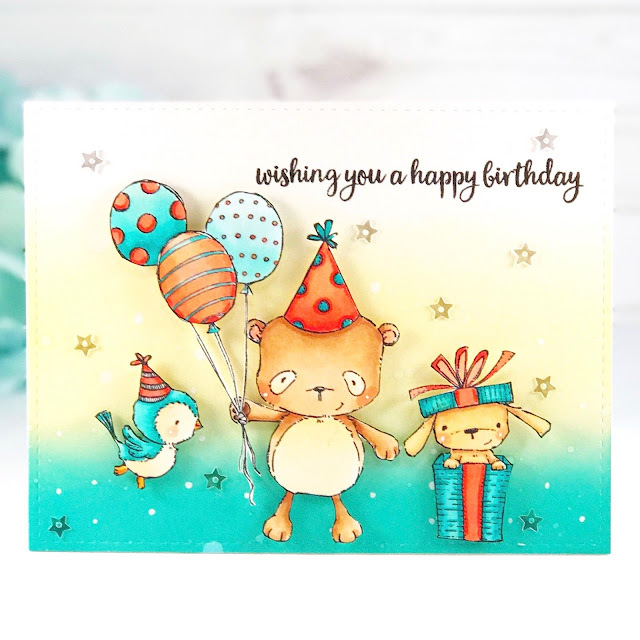 Stopping by to share a card that features the new Barnyard Buddies and Missing Ewe stamp sets from Sunny Studio Stamps. These two sets are a must have if you love cute farm animals like me! It's a versatile set with punny sentiments and lots of great images to make delightful scenes. I started by making the card front. I used A2 trimmed Bristol cardstock and stamped the barn and the fence using Copic friendly black ink. Then, I stenciled in the clouds using Peacock Feathers Distress Ink. Afterwards, I stamped the sentiment and colored the rest of the front with Copic markers. Since the sentiments says "Greetings From The Funny Farm" I thought it would fun to add a pig flying away tied to balloons. So, I used the balloon stamp from Oceans Of Joy, and used the masking technique to build it into a bouquet of balloons on smooth white cardstock. I stamped the rest of the farm animals on the same cardstock and colored them with Copic markers. I had so much fun coloring them. For this card, I decided I didn't want any white borders, so I fussy cut all of them and went over the edges with Memento Tuxedo Black Marker for a cleaner look. Lastly, I created the rest of the funny scene with the chick on top of the sheep's head looking up at the pig and mounted the chicken slanted. I used foam adhesives to add the images to the card front for dimension. Thank you for stopping by the blog! Have a great day! Hello everyone! Stopping by to share an Autumn card featuring the Pretty Pumpkins from Sunny Studio Stamps. This is a fun stamp layering set that gives you beautiful, realistic looking pumpkins. To begin, I stamped the pumpkins using Distress Oxides in Fired Brick, Worn Lipstick, Spiced Marmalade and the stems using Cracked Pistachio and Peeled Paint. I used the Pretty Pumpkins dies to cut them out. I love adding critters to my cards so I borrowed the adorable owl from Happy Owl-O-Ween and did no-line coloring with Copic markers. I cut him out with Happy Owl-O-Ween die. For the front panel, I inked it with Worn Lipstick, Spiced Marmalade, Fossilized Amber and Peeled Paint. I splattered it with water and blotted dry with paper towel. The sentiment is from Autumn Greetings Stamps, I heat embossed it using gold embossing powder. I added the images with adhesives and foam adhesives to the front panel. Lastly, I mounted the die-cut frame with foam adhesives. I hope you like today's card. I had so much fun working with the wonderful stamps. Hello friends! I have a fun Halloween card to share with you today using Pretty Pink Posh products. It features the adorable Halloween Friends stamp set. I stamped and colored the images with Copic markers and die-cut them out. I added Stardust Stickles to the moon for shine. For the background panel, I used the die-cut acetate to create clouds using Wilted Violet and Faded Jeans Distress Oxides. To make it darker I went over the clouds with Black Soot Distress Oxide. I also splattered water and white paint to the background. Once dried, I adhered the die-cut ground and added the sentiment that was heat embossed in white. I mounted the frame with foam adhesive. Lastly, I adhered the images with foam adhesive and glued on the star sequins. Hello crafty friends! Purple Onion Designs Anniversary sale is here! It's a great time to pick up those stamps you wanted, make sure to shop early for the best selections. I made a birthday card using adorable critters from Stacey Yacula's collection to celebrate the start of the sale. I stamped and colored the images with Copic Markers and fussy cut them out. For the front panel I distressed the die-cut Bristol cardstock with Antique Linen and Peacock Feathers Distress Inks. I added splatters of water and white dots with white Gelly Roll pen. I stamped the sentiment with Versafine black ink. I mounted the images with foam adhesive and glued on star sequins to finish the card. 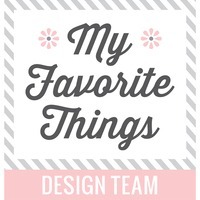 Head on over to Purple Onion Designs's blog for more inspiration from the design team. Hello everyone! 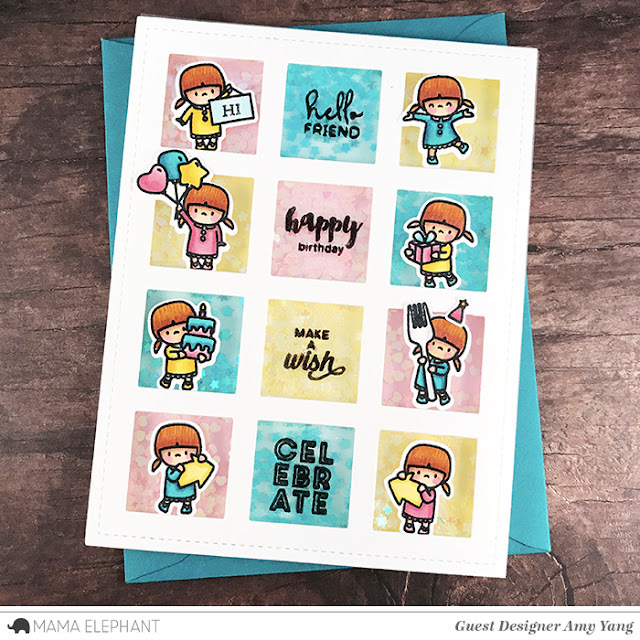 I have two cards to share today featuring the Little Boy Agenda stamp set from Mama Elephant, along with some fun creative cuts that are just perfect to use with the Little Agenda collection. To begin, I stamped the adorable little boys on smooth white cardstock and colored them with Copic markers. I used their coordinating dies to cut them out. To create the front panel, I used the big frame from Peek a Frame Creative Cuts to die-cut white cardstock. Then, I die cut that panel with a window frame from Chelsea Creative Cuts. I inked the negative squares with Twisted Citron and Peacock Feathers Distress Inks. I stamped the sentiment "Wishing You" from the Wishing You set with Versamark ink, and heat set light blue embossing powder. 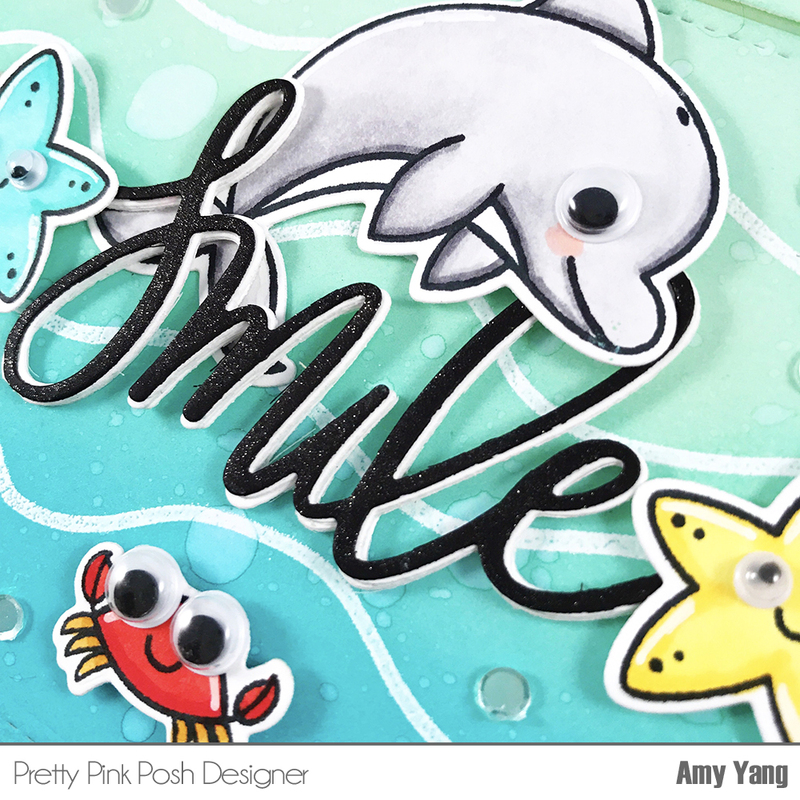 I also stamped and embossed "Lots of Smiles" on a thin strip of paper and inked it with Twisted Citron Distress ink. I added foam adhesive behind the front panel and adhered it to an A2 size card base. To finish, I adhered the negative squares back into the window, and mounted the little boys and the "Lots of Smiles" sentiment with foam adhesive to the front panel. For my second card, I stamped the boys again on smooth white cardstock, and colored them with Copic markers. I also added a bigger boy from an older release, In My Heart. I die-cut the little boys with their coordinating Creative Cuts. To create my front panel, I die-cut Bristol cardstock with a big frame from Peek a Frame Creative Cuts. I distressed it with Cracked Pistachio, Scattered Straw and Antique Linen. I thought it would be cute to have the little boys inside a Polaroid frame, so I die-cut twelve white cardstocks with the smaller frame from Polaroid Fun Creative Cuts. I adhered three layers on each of the four frames for dimension. I used the four negative squares to create little scenes. I stamped some of the tiny images from In My Heart to add more interest to the scenes. I drew a tree trunk for the boy sitting and playing the guitar. I colored all the images with Copic markers. I stamped the sentiment "Wishing You an Awesome Day" from Tandem Extras with Versamark ink on trimmed black cardstock. Then, I heat set white embossing powder. From the same set, I stamped the "Hello" speech bubble and cut it out. To finish, I mounted the four small frames on the card front. I then adhered the colored negative cuts back in. Finally, I added the boys to the to the front, along with the sentiment and the speech bubble.